No, this is not my 28th attempt at making a vegetable soup! I simply used whatever I could scrounge up in the refrigerator and the pantry, and ended up and originally with 28 ingredients (OK, including the water). None of the amounts are critical. I make this soup a couple of times during the winter, when I can leave the pot outside in the cold. With two people, one batch lasts for a week. Inexpensive soup tomatoes will do fine, no need for perfectly shaped plum tomatoes etc. Use waxy red or white potatoes that do not fall apart when boiled! They typically have a thin skin, so you don't have to peel them. alternatively: 1-2 tablespoons (smoked) fish stock, or veal stock, or chicken, or duck stock; use home made fish stock if you can. 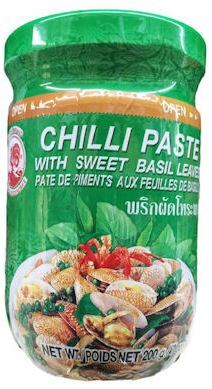 I actually prefer a can of Thai "Green Chili and Basil" soup. Your local Asian/oriental supermarket may carry it - mine no longer does. The main ingredients are Thai basil (note: "horapa" or Thai basil has an anis flavor; it does not taste like European/Mediterranean basil whatsoever! ; never not substitute the latter for That basil! ), cream of coconut, straw and oyster mushrooms, chili peppers, lemon grass, shallots, garlic, sugar, salt, bergamot leaves (similar in flavor to kaffir lime leaves), and "spices". Also very tasty as a gazpacho - right out of the refrigerator, on a hot summer day!